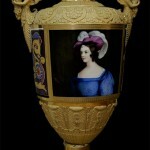 The 19th century vase made in the Imperial Porcelain Factory in Saint Petersburg is part of the Royal Palaces Collection in Dedinje. Blue seal (watermark) under the glaze on the inner part of the neck of the vase shows that it was made in the time of the Russian Emperor Nicholas I Romanov. We do not know the exact way this artefact arrived to the Collection. Inventory books and archival documentation show that the vase was part of the initial interior decoration of the one of the Dedinje palaces. 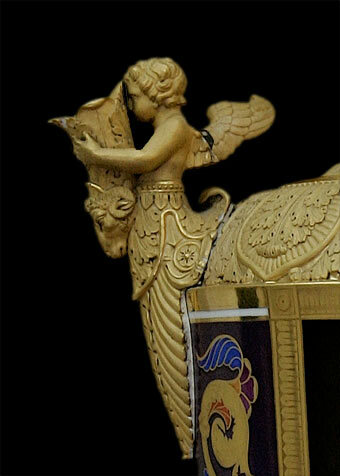 The porcelain vase is gilded, with handles in the shape of angels holding the cornucopia. The gilded body of the vase is covered with floral relief ornaments. In the middle of the vase there are two woman portraits, identical on both sides. 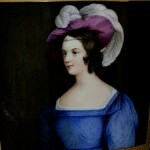 The portrait shows a girl dressed in a blue dress, with a pink hat adorned with white feathers. Although the identity of the girl is unknown the type of the dress tells that she was of a high social class. On both sides, portraits are surrounded by painted and coloured ornaments. The base of the vase resembles a pillar, coloured, which stands on a metal square stand. The Imperial Porcelain Factory was founded in 1744 in the city of Lomonosov, by Dmitry Ivanovich Vinogradov. The factory was founded for the Russian Court and the Romanov dynasty, and on behalf of Empress Elizabeth, the daughter of Czar Peter I the Great. At that time, the porcelain represented a symbol of social rank and was usually called “white treasure”. While visiting Saxony in 1718 in the Dresden court, Peter the Great had a chance to see items made of porcelain. He wanted to start this kind of manufacture in Russia and for this job he appointed a talented engineer Dmitry Vinobradov who managed to invent a formula for Russian porcelain. At the time the factory was run by Vinogradov, Russian porcelain was of similar quality as Saxon porcelain, despite the fact that the material was from Russia. In the beginning decorations were simple, while later they became more complex and finally turned into gilded miniatures. 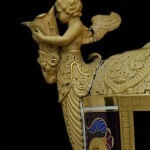 The characteristic of this kind of porcelain is gold, which was made from golden coins from the royal treasury. The factory was at its height in the time of Catherine the Great when it was renamed to Imperial Porcelain Manufacture. The Manufacture was required to produce items for the Imperial Court, but also it had to make a profit. The Russian court had high demands for porcelain and frequent orders required good quality items. For many representatives of a high social stature this porcelain was unattainable. In the time of Czar Paul I, the art of porcelain decoration evolved. Porcelain items were made with evident characteristics of neoclassicism – painted scenes from Greek and Roman mythology. In the first quarter of 19th century masters of porcelain production from Berlin and Sever were invited to come and improve the Russian Imperial Porcelain Manufacture. In 1806 Russia passed a law that prohibited the import of porcelain. That increased the competition between local porcelain factories and because of that the Imperial factory was forced to divide its production in two parts, one was intended for the Imperial Family and the other produced the porcelain of lower quality for Russian aristocracy. During the reign of Nicholas I (1825-1855), production technology was further improved. Kaolin (china clay) for production of porcelain was transported from Limoges. 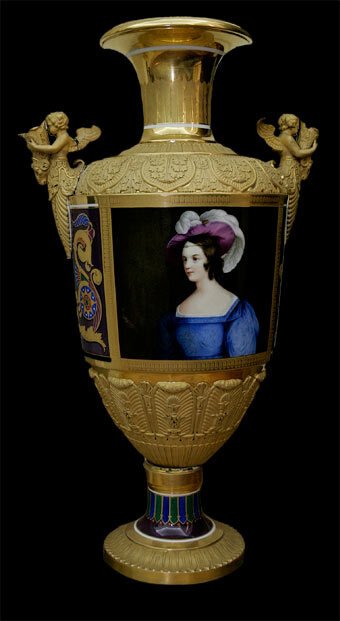 Various high quality porcelain items were produced, and the method of permanent gilding was perfected. Emperor Nicholas I was involved in managing the factory. The fact the Emperor was the one who approved all drawings for production of items, shows his dedication and interest in the management of this factory.